JMS provides engineering support to several DUKW operators around the world including San Francisco, Boston, Iowa, and Dublin, Ireland. The DUKW is a six-wheel-drive amphibious truck built by General Motors during World War II for transporting goods and troops over land and water and for use approaching and crossing beaches in amphibious attacks. These amphibious vehicles played an important role in both the European and Pacific theaters of the war. Over 21,000 DUKW’s were built and many still survive and are being restored by tour operators in the U.S. and elsewhere. However, significant modifications have to be made in order to bring these WWII military vehicles in compliance with modern passenger vessel safety standards. JMS has unique expertise and experience providing engineering and regulatory support to operators to ensure the highest degree of safety is achieved. This specialty started with the in-depth damage stability and engineering analysis performed by JMS for the National Transportation Safety Board (NTSB) after the tragic sinking of the MISS MAJESTIC in 1999. The NTSB presented JMS’ work at a public forum which subsequently resulted in safety recommendations and the US Coast Guard NVIC 1-01 specifically addressing DUKW vessel inspection requirements. 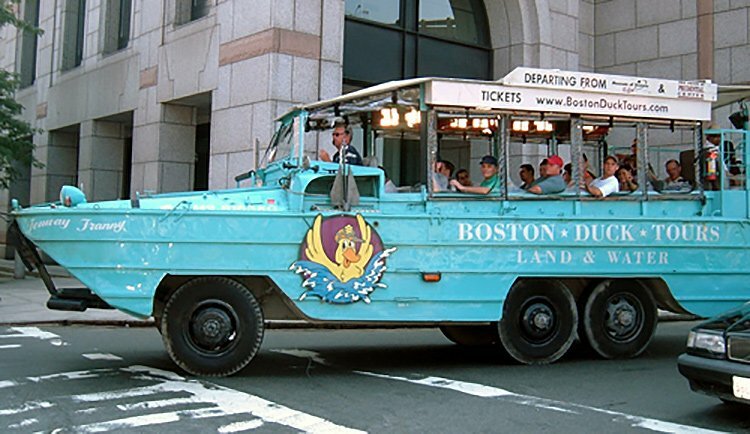 Boston Duck Tours continues to upgrade their 23 Duck fleet, consulting with JMS first as improvements are considered and then to assess stability after being accomplished. Another two of their “better than new” refurbished Ducks recently passed stability tests with JMS guidance. Bay Quackers is a Duck Tour company starting operations in San Francisco. Bay Quackers contracted JMS to assist in the process of obtaining a USCG Certificate of Inspection for their Ducks EL PATO and PEKING. In addition to physical inspection of the vessels, a full set of plans was stipulated by the Coast Guard Marine Safety Office in San Francisco as well as a stability test and operations drills. Given the vessels’ operation in San Francisco Bay, as opposed to the protected waters that most Ducks operate in, additional measures of safety had to be incorporated. EL PATO is the first Duck prepared for service in San Francisco.